Japanese honeysuckle is native to East Asia and it is today naturalized in many parts of the world. It is a hardy vigorous, dense, twining, evergreen or semi-evergreen perennial climber with hollow hairy stems and aired, ovate, dark green leaves up to 10cm long. In summer to autumn it produces fragrant white flowers that age yellow, followed by poisonous, blue-black berries. The fruit is only formed after a hot summer. It needs well-drained soil in sun or partial shade and is draught tolerant once established. 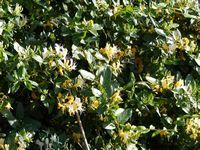 Japanese honeysuckle can be cut back hard in spring. Seeds can be sown in autumn or spring and once they are big enough to handle, they should be spaced about 1 meter apart. It makes a good ground cover, is useful on banks and makes an excellent screen for a north or east facing fence or to hide an unsightly object. A tea is made from the leaves, buds and flowers. The flowers, leaves and stems. The flowers are harvested in early morning before they open and are dried for later use. The stems and flower buds are alterative, antibacterial, anti-inflammatory, antispasmodic, depurative and diuretic. The stems are used internally in the treatment of acute rheumatoid arthritis, mumps and hepatitis. The stems and flowers are used together as an infusion in the treatment of upper respiratory tract infections (including pneumonia) and dysentery. An infusion of the flower buds is used in the treatment of a wide range of ailments including syphilitic skin diseases and tumors, bacterial dysentery, colds, enteritis, pain, swellings etc. 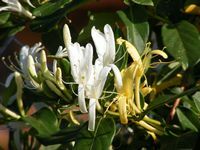 Japanese Honeysuckle is also used to reduce blood pressure. Experimentally, the flower extracts have been shown to lower blood cholesterol levels and are antibacterial, antiviral and tuberculostatic. 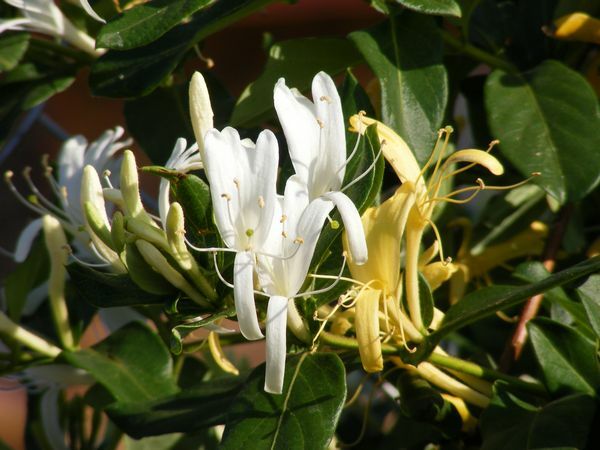 Externally, the flowers are applied as a wash to skin inflammations, infectious rashes and sores. Preserve flowers in vinegar/honey for the bath.